Research what has sold within the last 3 months in your suburb that is comparable to your own property. You can find this information online and by speaking to your local agents or seek a professional valuer. Most importantly, set a price that is realistic! Selling a property is a legal, contractual matter. We strongly recommend that you engage your solicitor before you commence marketing so that they can cover off any legal aspects with you, including when you need to have a contract for sale available for buyers. Interested buyers may ask for a copy of the contract once they have viewed the property. You could lose their interest if there are delays in having a contract prepared. If these need to be done to present your property at its best, get them done as soon as possible! The cost to upload a property is $139 + GST. It is entirely up to you how much information you upload aside from the minimum requirements (property type, suburb, number of bedrooms, bathrooms, parking spaces and price). If you are happy to upload more information buyers can better assess the suitability of your property. The street address however is never seen by the buyer. A brief description of the property helps buyers get a ‘feel’ for the property. As the owner, let buyers know what you love about the property and its location, its best attributes and features, as well as practical information such as land size, house or unit size, council and water rates, how many units there are in a block, strata fees, etc. An instant match occurs when a buyer’s purchase requirements matches with your property in terms of suburb, price and physical specifications. Both you and the buyer will be given each other’s contact details to discuss the property further and arrange an inspection if appropriate. If the buyer is interested in viewing the property and you are comfortable doing so, you would then provide the buyer with the street address of your property. 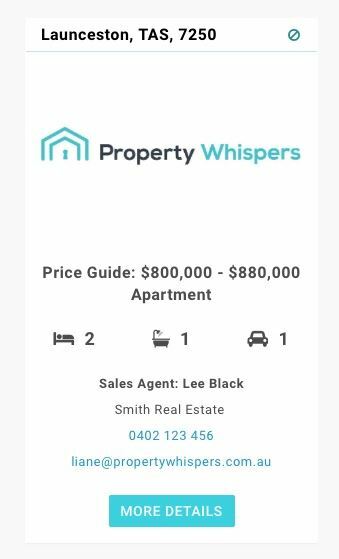 Property Whispers never gives buyers the street address of a property, only the suburb. An example is below of what the buyer will see when a match occurs. If a buyer clicks on 'More Details' the property description and photos are revealed (if provided). An example of what you will see on your Dashboard is below showing the contact details of the buyer. When you talk to a buyer on the phone, make sure you have the time on the phone to respond fully to their questions. If you arrange for them to view the property, confirm the time and address by text message so that they diarize it correctly and can contact you if needs be. Arrange a time that will show the property at its best and at a time when there is plenty of natural light. If it has a sea view that is only visible during the day, best not to have the inspection at night! If for any reason you need to change the inspection time, let the buyer know as soon as possible; 'a buyer inconvenienced is often a buyer lost'! Always make sure the property is clean and tidy inside and outside – and put your valuables away - before buyers walk in. Open windows to get fresh air through. Turn all lights on in every room (except where there is an abundance of natural light). You may wish to include fresh flowers in some of the rooms or burn some lightly scented candles. A property should be quiet and peaceful during an inspection however some soft background music is good to have on. Try and keep noisy kids, loud music and barking dogs to a minimum! Make sure the property is ready a few minutes before the inspection time and is prepared. Be attentive but give the buyer some personal space to view the property themselves. Know your land, house or unit size, council and water rates. If a buyer asks a question and you undertake to get back to them with an answer, you should do so in a timely manner. We recommend you have an adult friend or family member with you at each inspection. Buyers may ask to do certain inspections related to the property. These may include a building inspection, a pest inspection or an inspection of the strata records for a block of units. If you live in a strata block, you should have the contact details of the Secretary so that buyers can arrange these inspections. If a buyer is interested in purchasing your property they may make you an offer to buy it at a particular price and with or without other purchase conditions (eg) relating to the deposit amount, settlement period, etc. You should always ask that any verbal offer be emailed to you so that you can consider it in writing. Once you have received an offer you may decide to accept it, reject it or seek to negotiate a better deal. If you and the buyer agree price and terms, your solicitor will guide you through the legal process to sell your property. Both parties need to sign the contract and the buyer needs to pay the agreed deposit into a Trust Account with your solicitor. Your solicitor will liaise with the buyer’s solicitor and undertake the work necessary to effect settlement on the agreed settlement date. Once settlement has occurred you have successfully sold ‘off-market’. Congratulations! Note: The above are generalized tips only and there may be other matters for a vendor to consider in selling property. The tips do not substitute for professional advice that a seller should take in relation to the matters mentioned.